As of this posting, the Untold AI analysis stands at 11 posts and around 17,000 words. (And there are as yet a few more to come. Probably.) That’s a lot to try and keep in your head. To help you see and reflect on the big picture, I present…a big picture. This data visualization has five main parts. And while I tried to design them to be understandable from the graphic alone, it’s worth giving a little tour anyway. On the left are two sci-fi columns connected by Sankey-ish lines. The first lists the sci-fi movies and TV shows in the survey. The first ten are those that adhere to the science. Otherwise, they are not in a particular order. The second column shows the list of takeaways. The takeaways are color-coded and ordered for their severity. The type size reflects how many times that takeaway appears in the survey. The topmost takeaways are those that connect to imperatives. The bottommost are those takeaways that do not. The lines inherit the takeaway color, which enables a close inspection of a show’s node to see whether its takeaways are largely positive or negative. On the right are two manifesto columns connected by Sankey-ish lines. The right column shows the manifestos included in the analysis. The left column lists the imperatives found in the manifestos. The manifestos are in alphabetical order. Their node sizes reflect the number of imperatives they contain. The imperatives are color-coded and clustered according to five supercategories, as shown just below the middle of the poster. The topmost imperatives are those that connect to takeaways. The bottommost are those that do not. The lines inherit the color of the imperative, which enables a close inspection of a manifesto’s node to see to which supercategory of imperatives it suggests. The lines connected to each manifesto are divided into two groups, the topmost being those that are connected and the bottommost those that are not. This enables an additional reading of how much a given manifesto’s suggestions are represented in the survey. The area between the takeaways and imperatives contains connecting lines, showing the mapping between them. These lines fade from the color of the takeaway to the color of the imperative. This area also labels the three kinds of connections. The first are those connections between takeaways and imperatives. The second are those takeaways unconnected to imperatives, which are the “Pure Fiction” takeaways that aren’t of concern to the manifestos. The last are those imperatives unconnected to takeaways, the collection of 29 Untold AI imperatives that are the answer to the question posed at the top of the poster. Just below the big Sankey columns are the five supercategories of Untold AI. Each has a title, a broad description, and a pie chart. 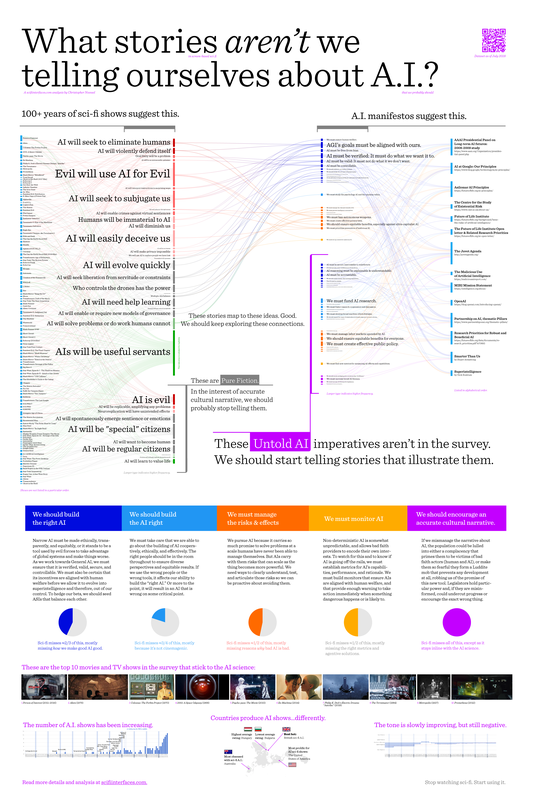 The pie chart highlights the portion of imperatives in that supercategory that aren’t seen in the survey, and the caption for the pie chart posits a reason why sci-fi plays out the way it does against the AI science. At the very bottom of the poster are four tidbits of information that fall out of the larger analysis: Thumbnails of the top 10 shows with AI that stick to the science, the number of shows with AI over time, the production country data, and the aggregate tone over time. You’ve seen all of this in the posts, but seeing it all together like this encourages a different kind of reflection about it. Note that it is possible but quite hard to trace the threads leading from, say, a movie to its takeaways to its imperatives to its manifesto, unless you are looking at a very high resolution version of it. One solution to that would be to make the visualization interactive, such that rolling over one node in the diagram would fade away all non-connected nodes and graphs in the visualization, and data brush any related bits below. A second solution is to print the thing out very large so you can trace these threads with your finger. I’m a big enough nerd that I enjoy poring over this thing in print, so for those who are like me, I’ve made it available via redbubble. I’d recommend the 22×33 if you have good eyesight and can handle small print, or the 31×46 max size otherwise. Maybe if I find funds or somehow more time and programming expertise I can make that interactive version possible myself. Sharp-eyed readers may note that there are some new nodes in there from the prior posts! These come from late-breaking entries, late-breaking realizations, and my finally including the manifesto I was party to. Sundar Pichai published the Google AI Principles just last month, so I worked it in. The Juvet Agenda also made me realize that I needed new, related nodes for both takeaways and imperatives: AI will enable or require new models of governance. (It had a fair number of movies, too.) See the detailed graph for the movies and how everything connects. The poster’s type is mostly Sentinel, a font from Hoefler & Co., because I think it’s lovely, highly readable, and I liked that Sentinels are also a sci-fi AI. This entry was posted in ~Meta and tagged AI, artificial intelligence, best of, data visualization, Untold AI. Bookmark the permalink. A very nice job on the poster! I’m a visual learner, so it really breaks things out for me in an informative manner.